Megan Miranda is a new name to me though she has written several young adult novels before penning crime fiction. This is the second of her crime novels, and refreshingly not part of a long-running series. The narrative is viewed through the eyes of Leah Stevens, a former journalist now turned teacher. At the opening Leah, has relocated to Pennsylvania from Boston. She is following-up on one of her newspaper articles - one that spectacularly backfired, and resulted in her dismissal from the newspaper. She moves in with Emmy, a former flatmate who she encounters (apparently) by chance in a bar (eight years after sharing a flat together). From the outset, the reader is aware that things aren’t as they appear, with lots of contradictions and omissions in Leah’s narrative. Leah is an unreliable narrator, with a troubled past and a distinct agenda (which takes the reader some time to establish). The novel rapidly picks up both speed and tension, with the disappearance of Emmy and the discovery of a woman left for dead, near to their home. Leah, wary and paranoid (following her journalistic experiences in Boston), sets out to investigate; initially out of curiosity and then to clear her own name, as the Police find no evidence of Emmy’s existence. It appears that Emmy has a lot to hide, managing to avoid any form of trail of evidence leading back to her. There is a disturbing subplot, with Leah receiving threatening phone calls and emails from someone linked to her school. Leah draws erroneous conclusions as to the identity of the caller, which again makes the reader query Leah’s version of events. I found the central characters to be both original and intriguing as Emmy and Leah have interesting, well developed backstories and have a lot of similarities to each other. I found it refreshing that the characters weren’t ‘just’ victims, or taking matters into their own hands, seeking justice and revenge on men who had attacked them. On the surface, the novel appeared an unchallenging and easy read, with an engaging narrative style, but underneath the meniscus we find depth and insight. 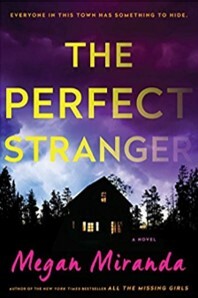 The novel challenges the reader to both explore and understand the reasons why some women, such as Leah and Emmy feel compelled to take action themselves, rather than rely on the police (and their employers to resolve troubling situations). Leah attempts to obtain justice for both herself and other women, by writing newspaper articles, exposing alleged abusers. Emmy however takes direct action, and is implicated in the deaths of two men, although we remain unclear as to ‘how she is involved’. I enjoyed reading the novel and weeks later the plot details and the characters remain clear and vivid in my mind, and so I am looking at this author’s previous work with interest.